My grandma, my father's mother, has a tradition. Whenever she shares a recipe, she intentionally leaves out an ingredient. This is a tradition passed down from her mother and her mother's mother. Still, sharing her runza recipe with her preteen granddaughter must fall under a slightly different category, because I'm quite certain I got it in its entirety when I copied it down years ago. 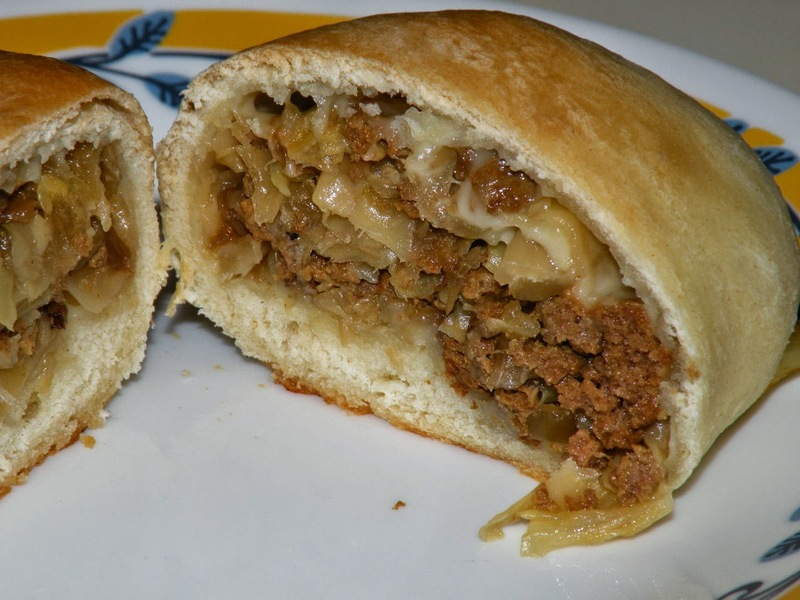 Runza's are very simply meat and cabbage wrapped up in bread dough and baked, but to many who have lived in Nebraska they are the stuff of legend. The ultimate comfort food. I hear the practice has been discontinued, but when I was a kid growing up, the local Runza restaurants had a deal going in the winter that whatever the temperature was at 6 am, that's how much runzas were that day. (Of course, you had to buy a drink to get the deal). So if it was 20 degrees out, runzas sold for $0.20. If it was zero or below, runzas were free! Without further ado, I present to you, the runza! Chop onions and garlic. Saute in a large frying pan with a little butter or olive oil until tender. Add ground beef along with generous amounts of salt and pepper. Cook through and drain well. 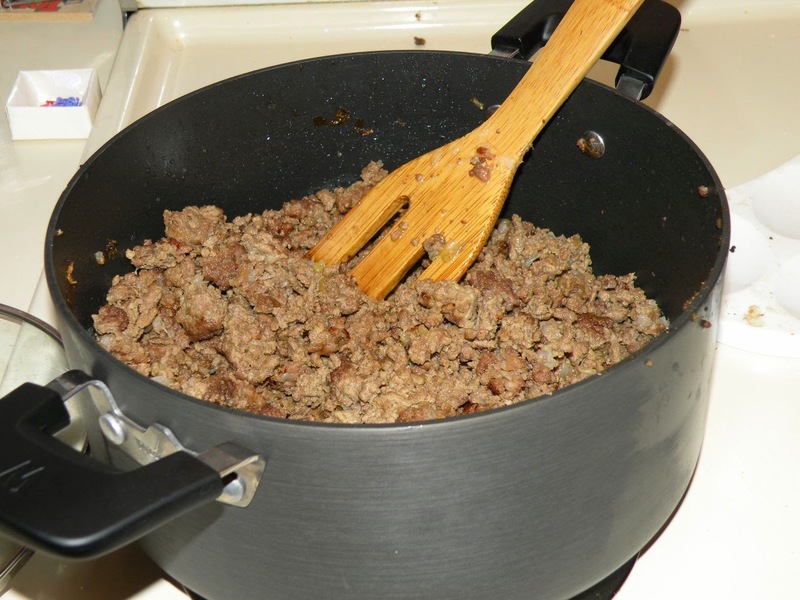 Put browned ground beef into a large pot (I've even done it in my crockpot!). Add cabbage and kraut juice. When I first started making my own runzas in college, I couldn't find kraut juice, so I used a can of sauerkraut. In fact, I started to think maybe I had the recipe wrong until I moved to Missouri and the grocery stores stock kraut juice on the shelves! If you're in a part of the country that doesn't stock kraut juice, just substitute a can of sauerkraut. Simmer 3-4 hours, stirring often. 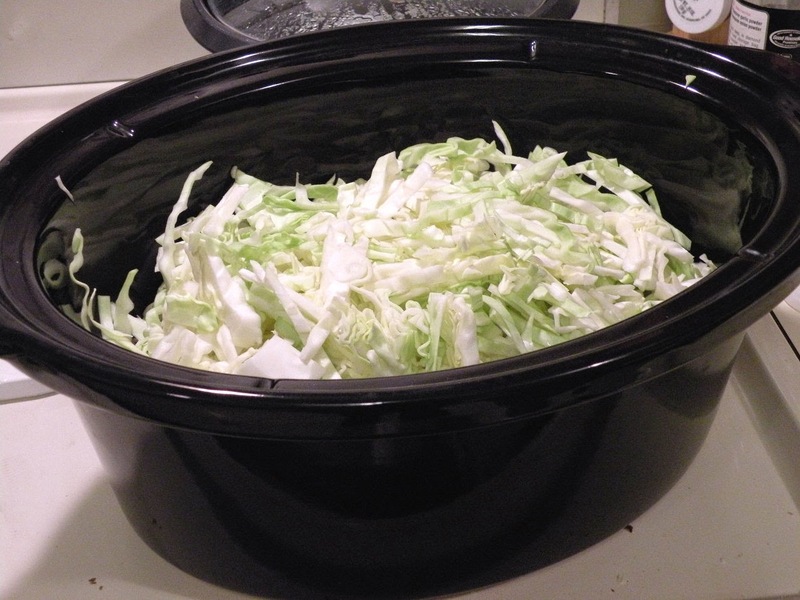 (If using a crockpot, you can leave it overnight on "warm" and it works out perfectly!) Drain and cool. Soften the yeast in the warm water. Add the shortening to the water to soften too. In a large bowl, mix together sugar, salt, and eggs. Stir in yeast mixture. Add flour one cup at a time, stirring well after each cup. 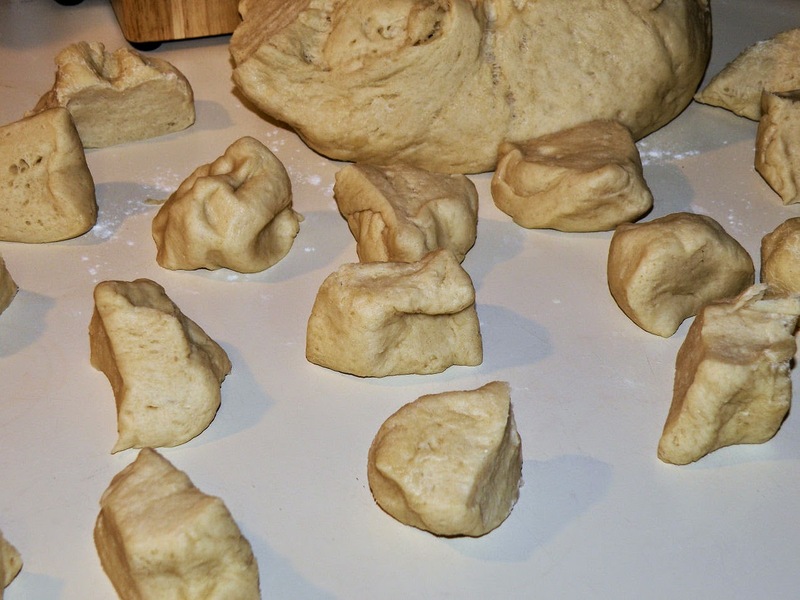 When the dough becomes too stiff to stir, turn out onto the counter and incorporate remaining flour by kneading. The amount of flour depends on the size of your eggs. When I let my bread machine do the mixing, I use large eggs and a little more than 7 1/2 cups of flour. Knead 200 strokes until the dough is elastic and smooth. Let rest in a covered bowl one hour or until doubled in size. Cut off golf ball sized pieces to roll out and fill. Most runzas I've had were oblong, but sometimes I make mine round -- usually when I have ingredient variations, like some with cheese and some without. This time I made a few with Swiss cheese. I made some with one spoonful of filling and some with two so there would be different sizes for different sized appetites. 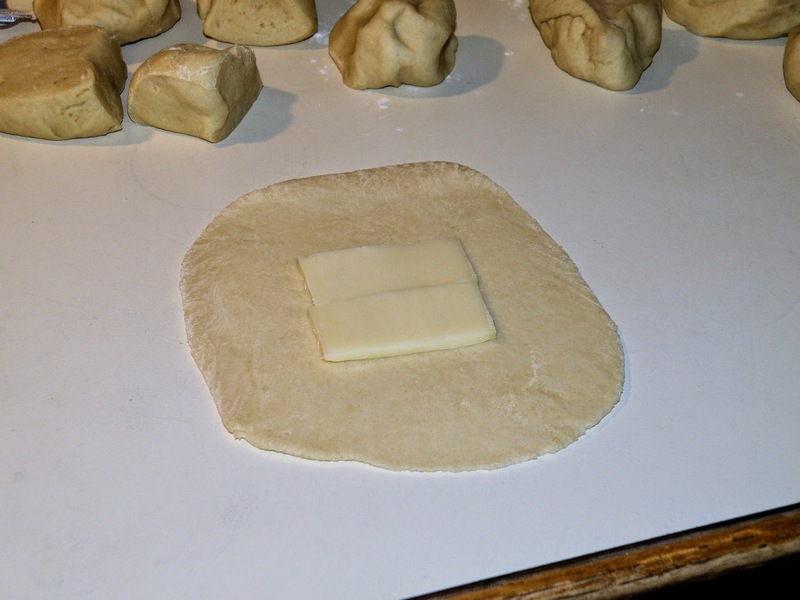 Pinch the sides together over the filling. Seal well so nothing leaks during baking. Place on a greased cookie sheet, cover with a clean cloth, and let raise at least half an hour. This is a good time to preheat the oven to 350 degrees. Sometimes I brush the tops with a beaten egg just before putting them in the oven. 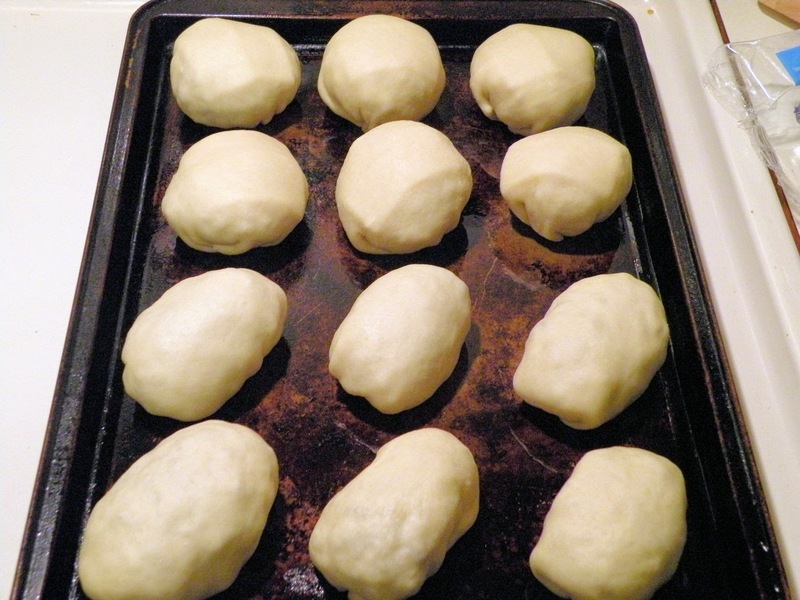 Bake the runzas in the oven 20-30 minutes until golden brown. Transfer to wire racks to cool. Try not to eat too many! This recipe makes about 3 dozen 3 inch runzas. (Of course you can make them whatever size is most convenient for your family). They freeze very well and make a great grab-and-go meal when you're in a hurry. 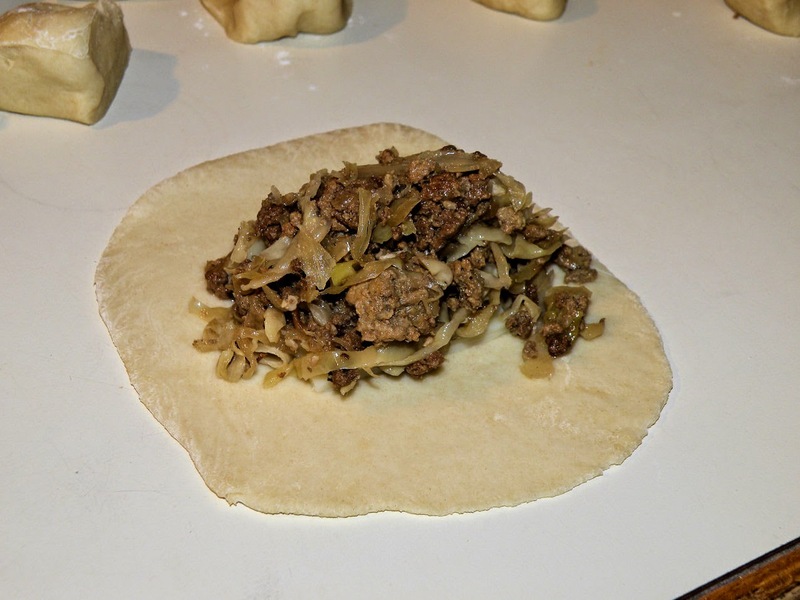 This is the most traditional runza recipe, but there are as many recipe variations as there are runza-eating families. Try adding your favorite sliced or grated cheese or incorporating some sausage into the meat mixture. The possibilities are endless! Your dough looks great! I'm going to try it. Runza does still do the temperature thing in NE! When we lived there in the 90's it was the whole month of January, but now they call it Temperature Tuesdays and only do it on Tuesdays in January. I guess NE is usually cold enough in Jan. that everyday got too expensive! Oh my god those are just amazing, I havent found a good receipe for a Runza since I left NE. Thankyou so much I ate so many I think I might explode. I am a very happy person tonight thankyou again for the amazing reciepe. The best receipe for a Runza I have ever found. Your Grandma didnt miss a single ingrediant. My wife and I are looking to make this recipe and freeze some Runza's for the first Nebraska game (GBR!!!). I have a couple of quick questions regarding the recipe. Just curious....how much kraut juice (oz.) do you add in to this recipe? Or does that not really matter....? Also, how many runza's, on average, does this recipe yield? Any help would be appreciated. Thanks! These were UNBELIEVABLE! We are Nebraskans living in Florida and miss our Runzas -- these were almost identical!! Best birthday dinner EVER (for my husband Tim). Thank you for sharing!!!!!! I'm so glad they turned out well for you! I need to stock my freezer as soon as the weather is cool enough for lots of baking. This is very, very close to the original recipe. Runza, though, does not bake the cheese inside, but instead makes a cut along the side and inserts the cheese of an already baked, hot runza. Just an fyi. That's exactly what my grandma does! In fact, once when I mentioned using different kinds of cheese in mine, she wondered why she never thought of putting the cheese in at the beginning! I have never heard of these, but they look delicious! I'm going to have to give this recipe a try!